Dr. Blood’s Coffin is effectively a variation on the Frankenstein story, with a mad scientist killing people in order to harvest their living hearts, transplant the hearts into the deceased, and try to revive the dead. The acting is good all around, and the scenery is enjoyable, but the pace is somewhat slow. For me, the most memorable part of the movie comes where the nurse (played by the beautiful and talented Hazel Court) is trying to reason with the mad scientist (Kieron Moore, who portrays the man slipping further into madness very well) about the morality of what he’s doing. His justification for murdering the village people — people that he grew up with? That their lives aren’t worth as much as “more worthy” people — such as scientists like himself — who can contribute to the world. It’s a frightening philosophy, of people playing God to choose who has the “right” to live. As Hazel Court’s character says, until you can create life from nothing, you have no right to destroy it. In an attempt to prove the correctness of his argument, Dr. Blood chooses to revive the lifeless corpse of the nurse’s first husband. Again, as the nurse says in the movie, the shambling, rotting, corpse isn’t her husband. It has no soul, and swiftly takes its’ murderous rage out on its’ creator. 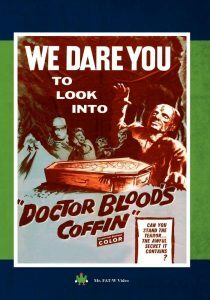 In all, Dr. Blood’s Coffin is an enjoyable, although not remarkable, horror film in the style that Hammer studios was known for — I rate it two stars out of five. Research scientist Dr. Peter Blood (played convincingly insane by Kieron Moore) moves home to his village of Porthcarron, Cornwall after being thrown out of medical school in Vienna for wishing to move from lab animals to humans. While living with his father, Dr. Robert Blood, he begins dating Nurse Linda Parker (Hazel Court). He also sets up in an abandoned tin mine, using curare on locals to acquire compliant “volunteers” in order to continue his heart transplant experiments. Blood’s knowledge of medicine and chemistry allow him to lead the police astray while appearing all along to be helping in the investigation of the disappearances. Hazel Court, of Hammer Films’ fame gives an outstanding performance, while supported by other Hammer alumni such as Ian Hunter, Fred Johnson and Kenneth J. Warren. The ending is eerily reminiscent of both Hammer and the horror/tragedy of Frankenstein.